SURFER. SHARK TAMER. FIRE WALKER. EXPLORER. TEENAGER. HERO. There was a Kingdom Filled with Adventure, Beauty, and Magic. When 16-year-old Prince Ailani, and his brother, Nahoa, trespass on a forbidden burial ground and uncover an ancient tiki mask, they unleash a thousand-year-old curse that threatens to destroy their tropical paradise. 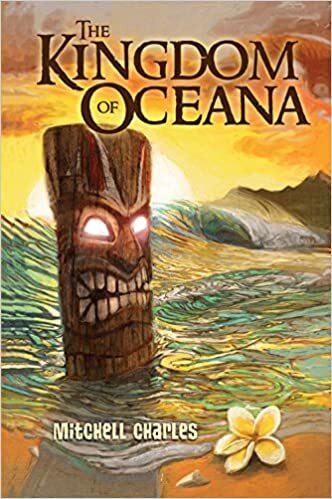 As warring factions collide for control of Oceana, it sparks an age-old conflict between rival sorcerers that threatens to erupt–just like Mauna Kea, the towering volcano. With the help of his ancestral spirit animals, his shape-shifting sidekick, and a beautiful princess, Prince Ailani must overcome his own insecurities, a lifetime of sibling rivalry, and a plague of cursed sea creatures brought forth by the tiki’s spell. Can peace be restored to the kingdom? Can Prince Ailani claim his rightful place as the future king of Oceana? TWO BROTHERS, BUT ONLY ONE CAN RULE. The Kingdom of Oceana by Mitchell Charles is an intriguing and highly entertaining read. The story is beautifully told with lessons, planted deep into its enchanting plot. The characters are quite interesting. They come to life as well as their ancestral spirit animals and the danger that is brought upon them all. Inside this fascinating tale, readers will meet two brothers. Both do something that unleashes a curse onto their world. Adventure, exotic places and animals, as well as a unique culture, will drag readers head first into this novel. A journey every reader won’t want to miss. Hawaii is the most beautiful places to travel to and now readers can go there by following these two brothers as the danger builds and the tensions boil. Overall, I loved reading this engaging YA novel. The threat of a thousand-year-old curse mixed in with mythology is always exciting to read about especially if Mitchell Charles writes it. The talent from this writer is amazing. I look forward to reading more by Mitchell Charles in the future.